Club Penguin Cheats by Mimo777 Club Penguin Cheats by Mimo777: Find Sensei With Mimo Tracker! So, yeah, Sensei has been here for the whole Card-Jitsu Party and there are "0" Days left! Ha! Well I believe the party will last another day or two, so now's our last chance to find Sensei! Have you found him yet? Well, if not, you can now FIND Sensei with the Mimo Comment Tracker! Just look in the comments for the latest sighting on Sensei on Club Penguin. I found him! He's in my imagination! He's in yours too! Where is Sensei any body please? 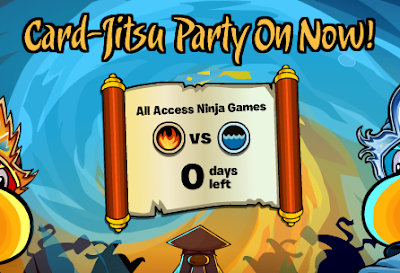 it says -1 days for the card-jitsu party thing! I found him! He's in the water dojo yesterday on the server Zipline.